I say "new" because I got a wild hair and completely redid the whole space the other day. The before wasn't working for me as a designer OR as an illustrator. I usually spread my stuff (computer, paper, planner, ipad, etc.) out on the sofa or the kitchen table, instead of my office space - which just wasn't inspiring. I think my low-point was when I had to have a client meeting at my kitchen table. Yes, the KITCHEN! 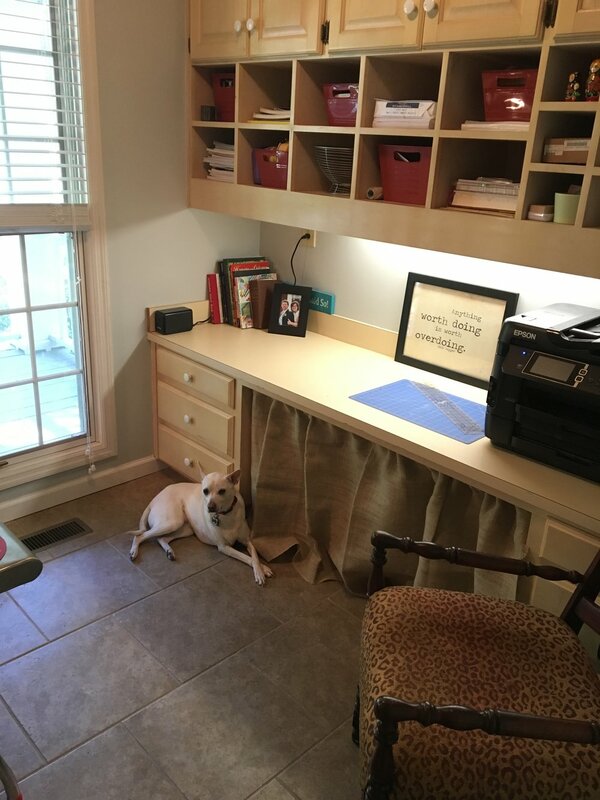 I mean, there's nothing wrong with my kitchen (I didn't have any dirty dishes in the sink or anything), but I needed an office space... a place for Laura Murray Creative ... a place to inspire me. I bought this stainless steel kitchen prep table several months ago and it was just sitting in there holding junk. I'm tall (almost 6ft tall TALL) and I needed something higher than the usual desk. I LOVE my desk, but now I just need to find the perfect chair! See that little nook behind the desk? It used to be a built-in ironing board, but I built those little shelves so I can keep important (small) things right in front of me while I work. 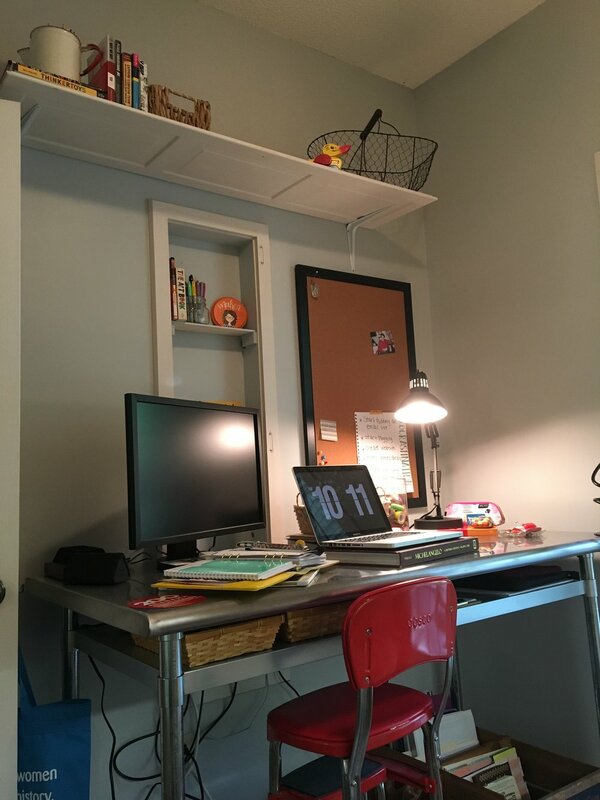 The door to the old cabinet is above the desk as a shelf! I love recycling old things instead of buying all new stuff! Office/Studio, meet your new client chair! I've had this a while, but it's kind-of floated around the house from room to room looking for the perfect place to be. I bought this chair for about $30 and re-padded/recovered it for MAYBE $10 of materials. Voila - new client chair! The quilt was one my great grandma made for me when I was born. I LOVE the funky 70's polyester! The built-in (WAY TOO LOW) desk across the room now has a cute skirt to hide some inventory storage. YAY for HIDDEN STORAGE! Belle likes it too! 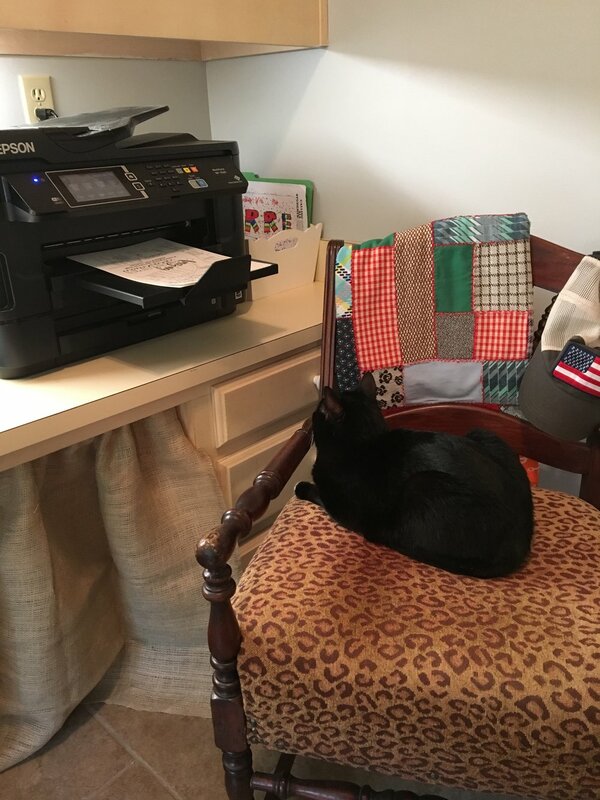 Oh, and Miss Kitty is OBSESSED with the printer. She comes GALLOPING in the office as soon as she hears it turn on. This is her new favorite spot - she can keep her eye on it at all time. Now everything has a place. I'm not saying it's all going to stay in it's place, but I'm trying!